The Wolfman Panel is a petroglyph site located near the south end of the Butler Wash Road near Bluff, Utah. The panel consists of multiple images that were precisely inscribed into the dark patina of the cliff. There are also a few remaining walls of a cliff dwelling across the wash that are passed on the hike in to the Wolfman Panel that we took the time to hike over to for this post. 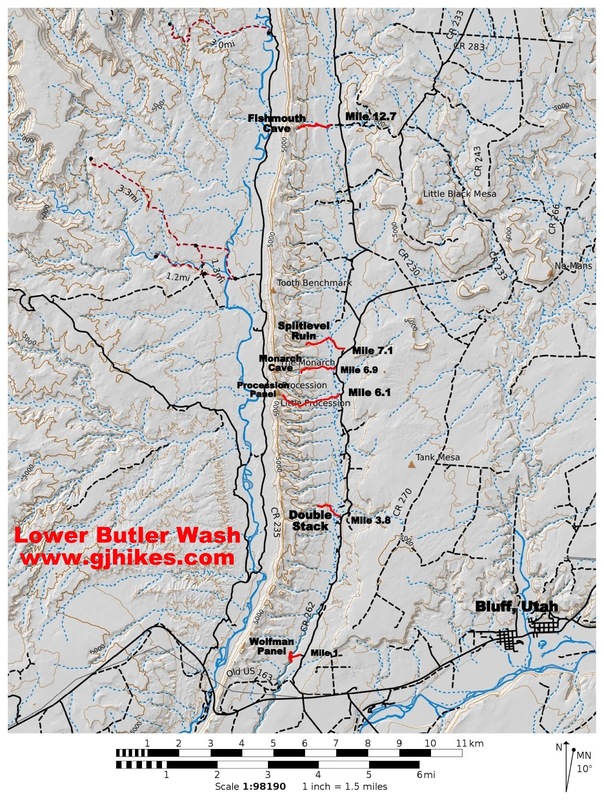 The Butler Wash Road is located about 4 miles west of the town of Bluff where it intersects with Highway 163. As you leave Bluff heading west on Highway 191 continue on Highway 163 from the intersection. where Highway 191 makes a 90 degree left hand turn to the south and Highway 163 begins. A short distance down the road you will see a turnoff on the left for the airport. At this point turn right and pass through the gate and you will be on the Butler Wash Road. The Butler Wash Road starts out as gravel but after a short distance it leaves the gravel road and becomes dirt and slickrock. The slickrock has had a pavement grinder taken to it to smooth out the humps. Follow the road until you measure almost 1 mile from the highway and you will come to a fence and cattle guard. On the other side of the fence is a BLM information kiosk but before crossing the cattle guard you will want to turn left and follow the road along the fence to a parking area that serves as the trailhead for the Wolfman Panel. The trail begins at the 3 brown mylar trail markers and heads towards the wash across the slickrock. 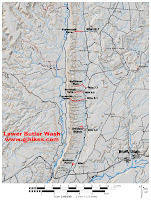 You will notice a few cairns as you come near to the wash. At this point the trail turns to the south along the rim. 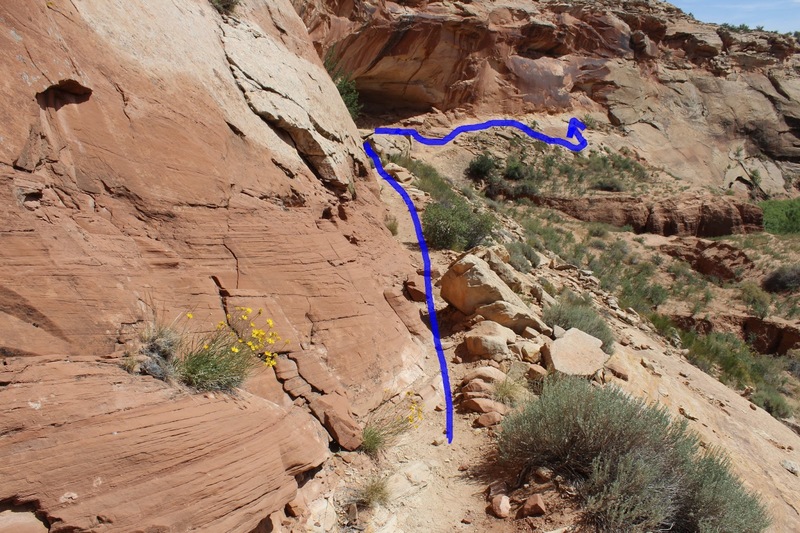 Before continuing along the trail you can hike closer to the rim and see a cliff dwelling across the wash. The petroglyphs are located on the far side of an alcove beneath the rim. Getting down to the bench area below the alcove requires squeezing between a large boulder and the cliff followed by a little minor scrambling. A good ledge serves as the path after you get past the boulder. The petroglyphs are best viewed from the area about 30-40 feet beneath them. Most of the petroglyphs are large and very distinct and show up very well. There are a few images like the Wolfman that are in the lighter rock that you may want to get closer to view. Meet the Wolfman. Arrrrrrr! It must be time for a bedtime story. A very nice shield emblem that looks amazing up close is on the right of this photo and what most people think looks like an owl head toward the left side. The panel on the right looks like a morph from something out of Egypt. They are all pretty impressive. 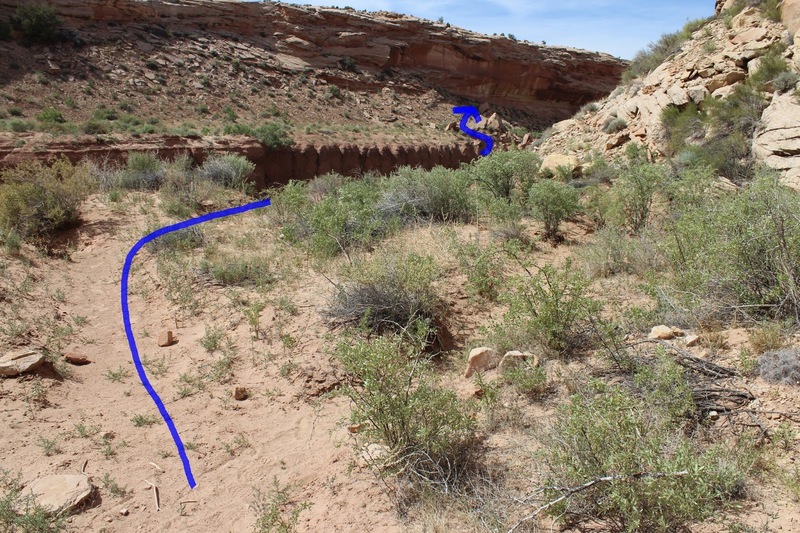 After coming this close to the cliff dwelling on the other side of the wash it seems a shame not to venture over and take a look at it. By far the best route to take is to follow the trail along the base of the cliff that you came down on. Getting into the wash that is thickly over grown with willows is relatively easy. Getting up the cliff on the other side is a real scramble. We saw a couple with a young girl make the journey so that cinched it for us to do the same. The ruin is very interesting to look at close up. The rooms on the left, or south side, were made almost entirely from adobe type material with very few rocks used in the construction. The rooms on the right side appear to have been built at a different time but definitely by using the more customary cement and rock type construction. There are pottery sherds of various types along with corn cobs littering the area around the ruin. Three large holes remain that were bored into the cliff for logs that would have been part of a ceiling and possibly the floor of another level. The Wolfman Panel is a wonderful stop to add to your itinerary when visiting the Butler Wash side of the Comb Ridge. A 2-wheel drive vehicle with a careful driver should have no trouble getting to the parking area. Visitors could also park on the gravel road and hike over from there without adding too much to the length of the hike. For no more time and distance that is involved you get to see some excellent petroglyphs and ruins with a few artifacts remaining. The Wolfman petroglyph by itself is pretty cool. Someone did a good job of naming the site after the iconic image. If you would like to see it for yourself then all you have to do is 'Take a hike'.